On Tuesday, December 8, Justine Kummer will be presenting a public seminar for her MSc defence. Come hear about her research in the University of Alberta Biological Sciences Building room CW 313 at 1pm. 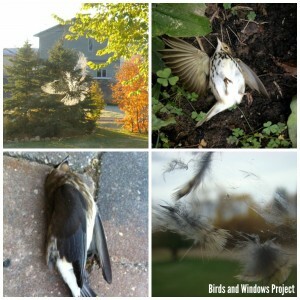 Every year a large number of birds die when they collide with windows. The actual number however is difficult to ascertain. Previous attempts to estimate bird-window collision rates in Canada relied heavily on a citizen science study that used memory-based surveys which may have potential biases. Building upon this study and their recommendations for future research the Birds and Windows citizen science project was designed to have homeowners actively search for collision evidence at their houses and apartments for an extended period. The first objective of the Birds and Windows project was to see how a more standardized approach to citizen science data collection influenced bird-window collision estimates and to see if the same patterns observed by memory-based surveys were observed using different data collection methods. Comparing the results from the Birds and Windows standardized searches and memory-based surveys revealed differences in absolute values of collisions but similar relative rankings between residence types. This suggests that memory-based surveys may be a useful tool for understanding the relative importance of different risk factors causing bird-window collisions. The second objective from the Birds and Windows project was to gain a better understanding of the factors affecting collisions at residential houses. It currently remains poorly understood which types of buildings and windows are most problematic. Understanding whether neighbourhood type, yard conditions, house attributes, or window types have the largest effect on collision rates is crucial for identifying which mitigation options might be most effective. Factors at the yard level had the best model fit for predicting bird-window collisions at residential houses. Conservation efforts should target variables at this level and those factors that attract birds to an individual yard. As few homeowners are likely to take an approach that reduces the number of birds in their yards, focus should instead be given to bird-friendly urban design and developing the most effective window deterrents. 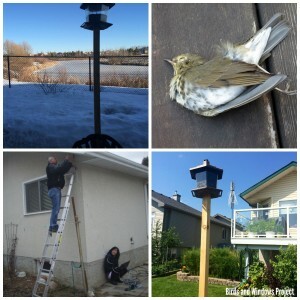 Finally, the effects of bird feeder presence and placement on bird-window collisions at residential homes was determined through a manipulative experiment. During the study there were 1.84 times more collisions when the bird feeder was present. However, there were no collisions at half of the study windows. High variance was observed in the number of collisions at different houses, indicating that effects of bird feeders are context dependent. Changing the occurrence, timing, and placement of feeders can alter collision rates but is only one of many factors that influence whether a residential house is likely to have a bird-window collision or not. In conclusion, I provide recommendations for conducting future survey-based citizen science projects and outline the next steps for bird-window collision research in working towards stopping avian mortality from collisions with windows. I have thoroughly outlined a number of factors affecting bird-window collisions and the focus of future research should now shift towards reducing the problem. 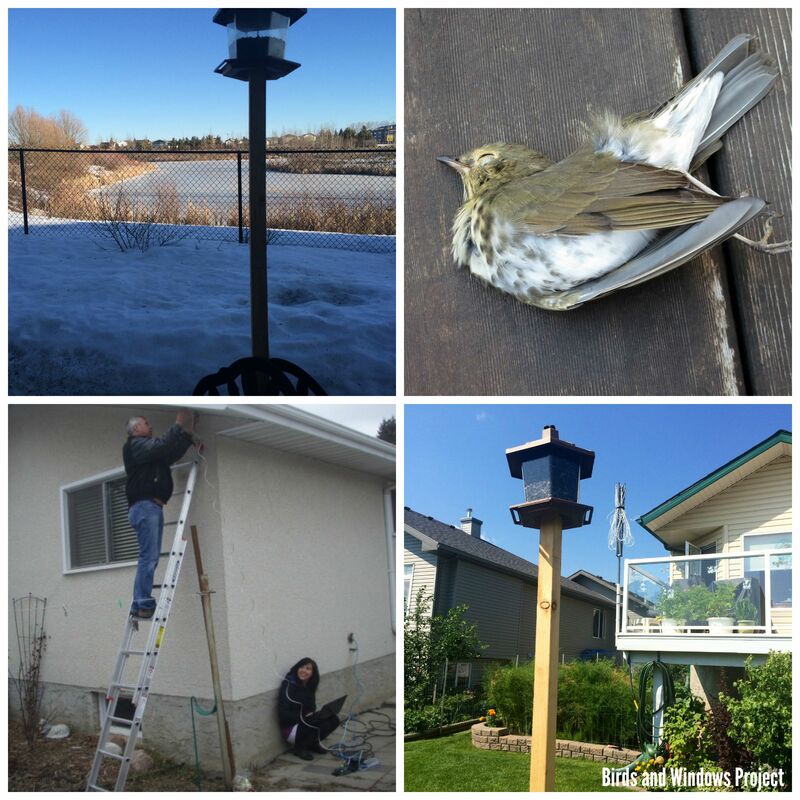 The Birds and Windows project saw a number of successes as a citizen science project and citizen science remains the best method for collecting large scale data in real-world scenarios and should continue to be used in similar experiments.